Historically, prophetic icons are celebrated for their distinctive qualities: Jesus for turning the other cheek and for reviving the dead; Moses for the Ten Commandments and wanting to see God; Vishnu for his pantheon of rebirth and Buddha for achieving nirvana, or spiritual perfection. And whilst there is often scant biographical detail about their actual lives, a prophetic personality exists in the mind of every believer. For their devotees, Jesus, Moses, Vishnu and Buddha are not legendary, but very real. Another historical figure hugely alive in the human psyche is Muhammad (SAW), the 7th century prophet of Islam, whose name means “the Praised One.”. His 23-year ministry was not only a devotional prophethood, but one of great learning. “Seek knowledge, even unto China,” was one of his most famous maxims. For an unlettered man, his legacy is remarkable. He would subsequently inspire an academic efflorescence that would spread to the rest of the world from the sands of Arabia. The universities of Baghdad, Cordoba – and even Bukhara – would produce scholars whose influence would endure for centuries. Algebra, astronomy, physics, chemistry, medicine, optics, musicology and philosophy were all refined by Islamic scholars such as Averroes, Avicenna and Al-Kharazmi. The 9th century engineer, Abbas ibn Firnas, would even experiment with flight. In its heyday Cairo’s hospital could accommodate 8,000 beds, and when the library of St Gall could only offer 36 books, the library of Cordoba could boast 50,000 volumes. And when 12th century Damascus had streetlights and sewage, Londoners floundered in effluent and darkness. Words such as “alchemy” and “alcohol” owe their derivation to Muslim chemists, and it was the mathematicians of Cordoba who introduced the zero to Europe, and its doctors who discovered the nature of smallpox. Muslims accept Muhammad (SAW) as the amalgam of prophethood, as he is considered the last of the prophets – and a light to all humanity. What also sets Muhammad (SAW) apart from other prophets – whom he regarded as his brothers – was that every moment of his life was recorded. Muslims know, for example, that their prophet had a silent laugh, that his black eyebrows were slightly arched, that his hair hung to his earlobes, that he walked leaning forward, that he had a long beard with a trimmed moustache and that he never raised his voice, or that he always chose the middle path. They also know that he dined with Christians, stood up for the funeral procession of a Jew, honoured agreements with his enemies, milked his own goats, stitched his own sandals and treated women equitably. It was Muhammad (SAW) who forbade the ancient tribes from burying their newly-born daughters – and who accepted a marriage proposal from a Meccan noblewoman, Khadijah. It was Muhammad who informed a prostitute she would find paradise because she’d given a thirsty dog water. It was Muhammad (SAW) who forgave the Quraish of Mecca who’d persecuted, tortured and killed his followers. It was Muhammad (SAW) who forgave Hind who’d eaten the liver of his uncle, Hamzah, after a battle. These traditions about Muhammad (SAW) – called Hadith – have been transmitted from generation-to-generation in chains of authority. Every piece of Muhammad’s (SAW) life has been recorded and graded for authenticity and context. With some 200,000 traditions attributed to him, Muhammad (SAW) is the most accessible prophetic figurehead today. From these traditions emerge a compassionate human being with the unconditional love of Jesus, the legal majesty of Moses, the humble hospitality of Abraham and the quiet spirituality of the Buddha. Informed by the injustice done to the image of Islam since 9/11, and the distortion of the true character of the Prophet Muhammad (SAW), a diverse group of scholars and community activists are hosting a mass commemoration of the Prophet’s birth, Mawlid SA 1434, at the Green Point Urban Park on January 27. The event has been organised in conjunction with the Cape-based Muslim Judicial Council, and according to spokesperson Nabeweya Malick, Mawlid SA 1434 aspires to reflect in Cape Town the spirit of Prophet Muhammad’s (SAW) message. “This message – one of peace – was not delivered at the point of the sword, but through compassion, and Muhammad (SAW) being a mercy to all universally and without exception. He was the prophet that brought us the lights of science and social justice. “At Mawlid SA 1434 we aim to show the humble, dignified way Muslims commemorate the legacy of Muhammad (SAW) during the month of his gracious birth. We’ve invited guests from around the world to grace the mother city for our big event,” she said. Shaikh Sayyid Ninowy from the US (and a descendant of the Prophet), Shaikh Ahmad Tijani Sidi Ben Omar and Shaikh Ahmad Qatáni al-Maliki (one of Libya’s top scholars) are among those attending. Local guests would include the ANC’s Cyril Ramaphosa,as well as mayor Patricia de Lille and premier Helen Zille. 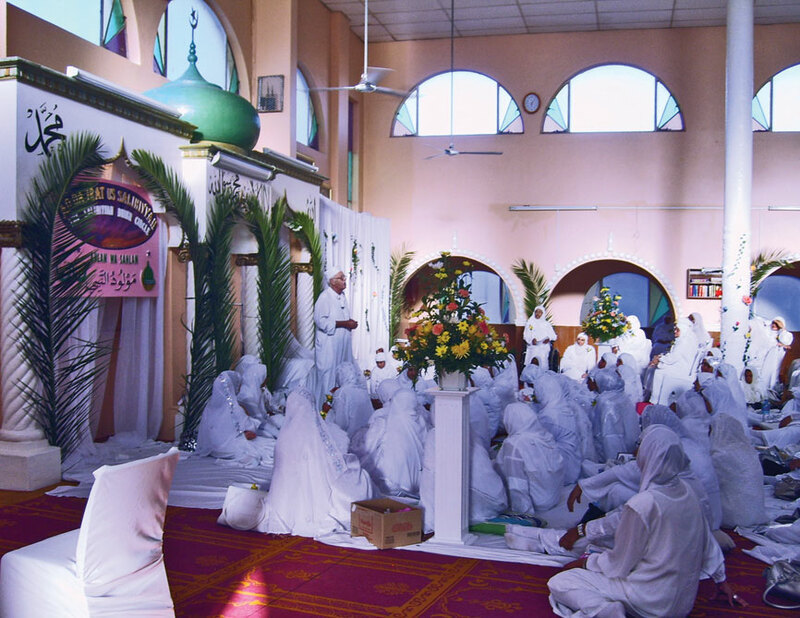 Malick has urged the community to participate in Mawlid SA 1434, saying that the commemoration of Prophet Muhammad’s (SAW) birth was a centuries old tradition. Mawlid SA 1434, she said, would be a “family affair” with Capetonians of all faiths welcome to join in. She requested that those Muslims attending the commemoration of the Muhammad’s (SAW) noble birth at the Urban Park on January 27 wear white (a colour loved by the Arabian prophet). Malick said that through “unity, dignity and respect” Mawlid SA 1434 would once again show the true, welcoming face of Cape Town Islam in the spirit of its founder. In the original Cape Argus op-ed (Tuesday, January 22) the appellation (SAW) – peace on the Prophet – was left out due to the predominant non-Muslim readership who would not know what it meant, and who would be put off by it on the page. Those who have so rudely accused me of disrespect may not be aware of this. It is the practice of many Muslim authors and publishers when reaching a general audience to leave out the appellation of peace. It is not done out of disrespect, but rather, a consideration for other readers not familiar with this practice. In this case, it was felt that the benefits of talking about the Prophet (SAW) in a good light on the main page of a daily South African newspaper far outweighed the negatives.